Thursday night’s Supernatural, “The Real Ghostbusters,” continued the meta arc that has been developing (possibly too much) this season. The brothers find themselves at a Supernatural fan convention, complete with Wincest references and LARPing. And, of course, a real ghost. 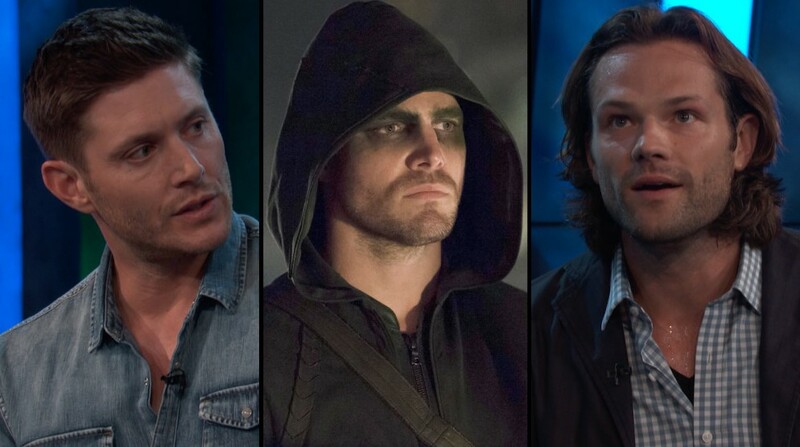 Like the episode two weeks ago, where the Winchesters wander through a TV show hell, this week we got more of the jokey meta-commentary on TV genres and fandom. Chuck the prophet and Becky the superfan were back, as headliner and organizer respectively at a Supernatural fan convention. (If you recall, Chuck published a cult-fave series of novels called Supernatural, based on his prophesies, before he realized that he was a prophet.) Everybody at the Con is dressed up as characters from the show, and Chuck is even asked questions by a stereotypical annoying uberfan during Q/A. In a silly German accent, Annoying Uberfan nitpicks his way through several question about how Sam could have been so stupid about Ruby, and asks why the brothers don’t put their weapons on bungees to prevent losing them in fights. The latter is a good point, which Dean acknowledges later in the episode as their weapons are knocked from their hands as usual. It turns out that the LARP the fans are playing at the Con is based on an actual haunting at the hotel, formerly an orphanage, where they’re staying. Several orphans were slaughtered by their schoolmistress, and now their spirits torment hotel guests on the anniversary of the murders. So you guessed it – the LARPers encounter the real deal and don’t know what to do. 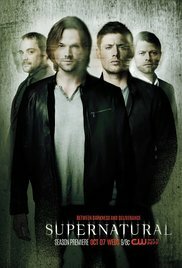 Except for two guys, playing Sam and Dean, who wind up helping the real Sam and Dean track down the ghosts’ bones and burning them before several people are scalped. There are a lot of in-group fandom jokes at the Con, and a few hilarious moments when Chuck is on stage telling his life story (“And then at sixteen I lost my virginity, but the next day my girlfriend told everybody in school it didn’t count.”) And he reveals that an anonymous Scandinavian patron is going to fund the publication of his unpublished Supernatural novels, as well as any he writes from now on. That’s sort of an interesting moment, because of course Chuck can’t live on prophesy alone – if he’s going to make enough money to eat, he has to pretend his books are cheesy paranormal romances, not archangel-protected prophesies of the Lord. I’ve always loved the way Supernatural equates trashy genre writing with prophesy. But, as Maureen Ryan said over at Chicago Tribune, “I like my meta as much as the next person, but the show does seem to be stalling a bit about getting to the mega.” We’ve got the Apocalypse going down all over the place, Sarah Palin is going to president in 4 years, and Sam and Dean are farting around with another silly meta plot complete with Becky the batty fangirl? There is an emotionally satisfying (and Wincesty) moment when the LARP Sam and Dean tell the real Dean that he “doesn’t understand the point of Supernatural” because he thinks being a Hunter is a horrible job. LARP Dean says, and I paraphrase, “In real life, I fix photocopiers. That’s a sucky job. Getting up and saving the world every day, and having a brother who would die for you, that’s incredible.” And Dean has a kind of Buffy the Vampire Slayer moment where he realizes that even though he nearly dies every day, his life might be more meaningful than LARP Dean’s. Then he thanks LARP Sam and Dean for their help, and they cuddle up together and tell him they are partners who met in a Supernatural chat room. Yay, it’s a gay Sam and Dean moment! But heterosexuals get their time in the sun too, when Becky reveals that Chuck is her true love. (She fell for him when he heroically protected Con-goers from one of the ghosts.) There’s a winceworthy moment where Becky tells Sam it’s over between them, because she’s had this ongoing fantasy that they’re soulmates, and we wonder why such an irritatingly delusional person is all that Chuck can hope for. Seriously, I know Becky is supposed to be zany, but I hate the way her character is treated. She acts like she’s about 10 years old. Becky has her usefulness, however. It turns out that in her fannish zeal, she read one of Chuck’s novels/prophesies so carefully that she discovered something none of them realized. Ruby never gave the magical, potentially-Lucifer-vanquishing Colt gun to Lilith. Instead, she gave it to one of Lilith’s henchmen. Aha! Obsessive fandom saves the day, and gives the boys some much-need direction on their quest to find the Colt. Can’t wait for next week’s episode (the last of the year!) when by all accounts Lucifer will bring on the mega.